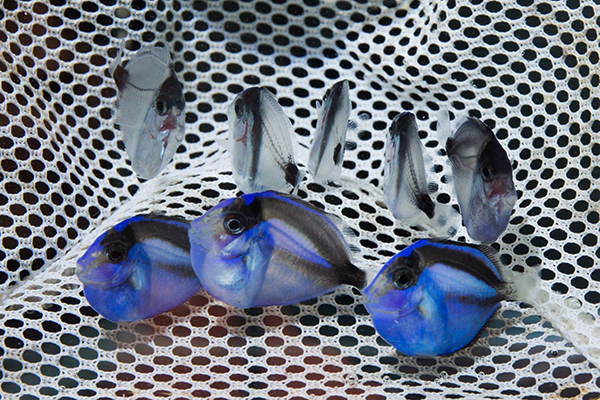 Pre- and post-metamorphosis Pacific Blue Tangs, Paracanthurus hepatus, spawned and raised at University of Florida’s Tropical Aquaculture Lab in Ruskin, Florida. Silver fish have not completed metamorphosis. Image: Tyler Jones. Fort Plain, NY, July 20, 2016—Rising Tide Conservation, in partnership with the University of Florida, announces the successful culture of Pacific Blue Tang surgeonfish, the species known as the character “Dory.” This major breakthrough is a major step forward in aquaculture of marine ornamental fish. Until today, all Pacific Blue Tangs were collected from reefs, primarily in Indonesia or the Philippines. 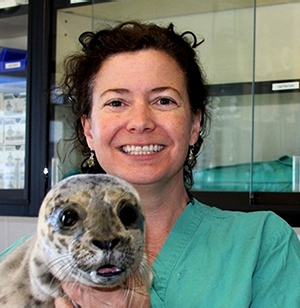 Dr. Judy St. Leger, head of the Rising Tide Conservation Initiative and an aquatic veterinarian. The advance was made possible by the efforts of a committed team of biologists, including Eric Cassiano and Kevin Barden at the Tropical Aquaculture Laboratory of the University of Florida in Ruskin, Florida. The laboratory is directed by Craig Watson, and the Rising Tide Conservation program is overseen by Dr. Matt DiMaggio. Rising Tide Conservation identified this species as one of conservation interest for aquaculture in 2010. Efforts have been underway to develop techniques for rearing this fish in both Florida and Hawaii at the Oceanic Institute of Hawaii Pacific University. Dr. Chad Callan of the Oceanic Institute commented, “The basis of Rising Tide Conservation is communication and sharing. This breakthrough came, in part from methods for propagating Yellow Tang here in Hawaii. We expect many more species to be successfully produced using the techniques that made these two iconic tangs possible.” Callan’s own team scored a major breakthrough in 2015 with the first commercial production of Yellow Tangs, a mainstay species in the marine aquarium trade. 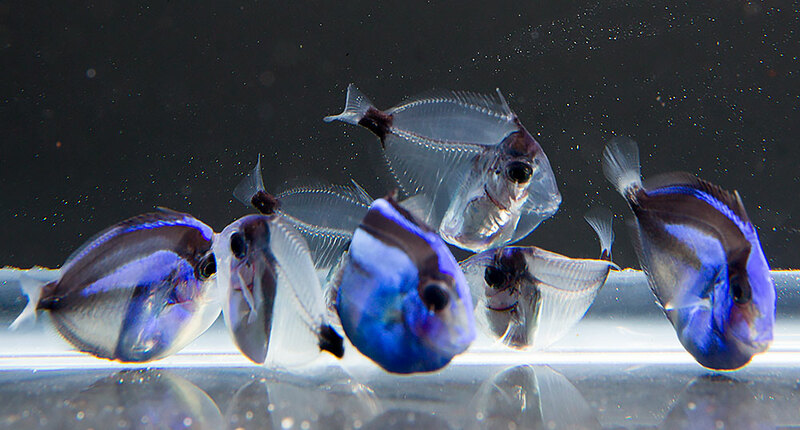 At 55 days post-hatch, these “baby Dorys” were photographed, not on an Indo-Pacific reef, but in a greenhouse in Ruskin, Florida. Established in 2009, Rising Tide Conservation is non-profit entity dedicated to coral reef conservation. The program develops sustainable aquaculture alternatives to collecting marine ornamental fish from reefs. Rising Tide is composed of integrated stakeholders from the public aquaria and zoo communities, research institutes and universities, tropical fish producers, wholesalers, and retailers, as well as numerous businesses and organizations in the hobby fish industry. 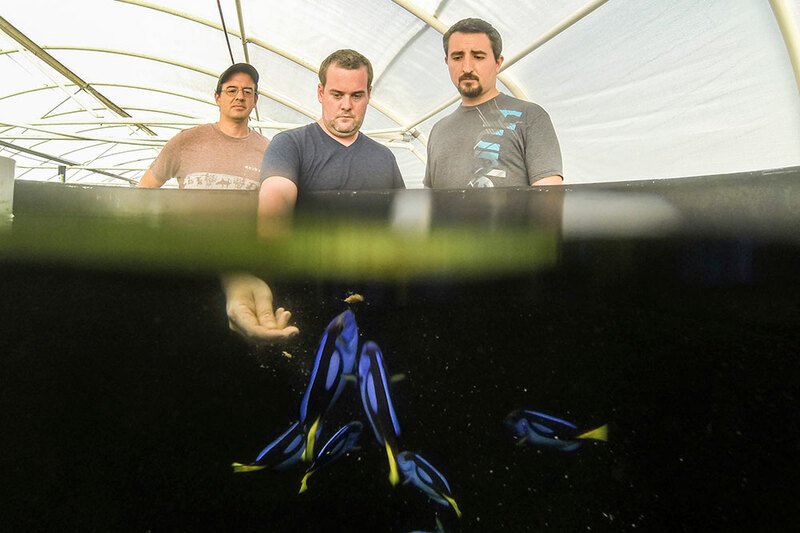 Established in 1996, the Tropical Aquaculture Laboratory is part of the University of Florida’s Institute of Food and Agriculture Sciences, and falls within the School of Forest Resources and Conservation. Its primary mission is to provide scientific research and extension support to Florida’s unique ornamental fish industry. Located in Ruskin, the lab includes both indoor and outdoor research facilities on a 6.5-acre fish farm, a disease diagnostic lab, and partners with the USDA and Hillsborough County Community College, which operate out of the facility. Go to tal.ifas.ufl.edu for more information. Image Credits: UF IFAS File Photos – photographer Tyler Jones. Used with permission. Editor’s note – stay connected with Reef2Rainforest.com and CORAL Magazine to learn more about this exciting story in the coming days and weeks ahead. Like us on Facebook, follow us on Twitter and Pinterest, get our bi-weekly email newsletter, and subscribe to our award-winning print and digital magazine! Best news all summer. Congratulations Team & “Thank You” for all your hard work & efforts! Best news all summer. Congratulations Team & "Thank You" for all your hard work & efforts!